Regular Railway travelers and others could have easily done with their Tatkal tickets as it opens at 10:00 am for AC Classes and for non-AC classes at 11:00 am, a day in advance of actual date of journey. Few might have a easy process to book Tatkal tickets and others find it tough. can be booked at railway counters. 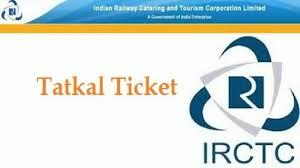 Tatkal tickets can also be booked online through IRCTC, which provides an e-ticket booking facility for the Indian Railways. A maximum of only four passengers per PNR can be booked for Tatkal tickets. 1) If the train is delayed by more than three hours at the journey originating point of the passenger and not the boarding point if the passenger’s journey originating point and boarding point are different. 5) If the party has been accommodated in lower class and does not want to travel. If people are travelling in lower class, the passenger will be given refund of difference of fare and also the difference of Tatkal charges. In case a confirmed reservation has been provided to an RAC or wait-listed ticket holder at any time up to final preparation of charts, such a ticket is treated as confirmed, according to the IRCTC website. An RAC or wait-listed ticket is presented for cancellation, the refund of fare is made after deducting the clerkage if the ticket is present for cancellation up to 30 minutes before the scheduled departure of the train, says IRCTC. Tatkal ticket booking charges are calculated as a percentage of fare at the rate of 10 per cent of basic fare for second class and 30 per cent of basic fare for all other classes subject to minimum and maximum as given here below, according to the Railways website. In case of an Tatkal ticket issued for travel for more than one passenger, some passengers have confirmed reservation and others are on the waiting list, a full refund of fare less clerkage is admissible for confirmed passengers also subject to the condition that entire Tatkal ticket is surrendered for cancellation up to 30 minutes before the scheduled departure of the train, according to IRCTC website. Railway Board chairman Ashwani Lohani has hinted at a revision in flexi-fare system in premium trains like Rajdhani, Shatabdi and Duronto, saying there will be some tweaking which will benefit both passengers and railways.